Fill a cocktail Shaker halfway with ice cubes. Add the Vodka, Coffee Liqueur, Creme de Cacao and Irish Whiskey Cream and shake well. Strain into Martini glass. 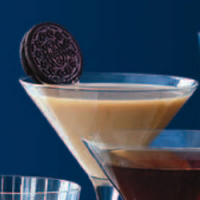 Slip an Oreo onto the side of each glass.